Bender: Care to contribute to the Anti-Mugging-You fund? Ever wanted to use the keyboard like a real computer pro? Microsoft based keyboards have a built in Windows Key, that allows users in Windows to do many useful tricks all with the touch of a keystroke. Even for dedicated geeks, some of these keyboard shortcuts might be new shortcuts to add to your list of tricks. First and foremost, all of these tips hinge off of the Windows key, or system key. 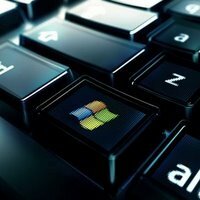 Most Window’s based computers have this key with the Microsoft “Windows” logo, like the one seen at the top of this article. For Mac users running boot camp, this key will of course be the key with your Apple logo on it, and a few generic keys might just have a computer or some other generic logo. The Windows key is usually in between the Control or Ctrl key, and the Alternate or Alt key. Older keyboards and older laptops, especially older Thinkpads are missing this key, so unfortunately you will not be able to make use of these shortcuts. In ordering the list, I started with the more common shortcuts and worked my way into the ones that even the biggest power user won’t often touch. Now on to the list! Windows + M + Shift: Brings everything back in the same order after hitting Windows + M Great for getting back where you were after hiding everything! Windows + D: Shows the desktop. This is very similar to Windows + M, only it will hide absolutely everything instead of just applications. Hitting it again will restore everything to where it was. *Locking the computer will secure a computer in the event that you are going to be away for a period of time and don’t want anyone accessing your system. In order to unlock your computer, one needs only to enter their username and password, or choose their username from the list and clicking ok/enter. In the event you don’t have a password leave that part blank and continue as you would otherwise. Great list. Have any “must have” free apps to review? It’s funny you mention the free apps, I’m working on a list like that right now! Do you have a dictionary to translate shortcuts between different OSes and different applications? That’s actually not a bad idea, I was working on getting up an Apple Key shortcut list as with the last few versions of OS X there have been a lot of really snazzy keyboard shortcuts added in, especially ones that leverage the graphical capabilities of the OS. Very good report we have to spread the word about this internet site.You deserve to have much more attention . Howdy its me once more , basically said that I might return back again and know the manner in which the chat appears to be going. Specialists state that personal loans help a lot of people to live the way they want, just because they can feel free to buy necessary stuff. Furthermore, some banks offer short term loan for different classes of people. Pausing there I waited until the foremost Sagoth hove into sight. Ghak and Perry had disappeared around a bend in the left-hand canyon, and as the Sagoth’s savage yell announced that he had seen me I turned and fled up the right-hand branch. My ruse was successful, and the entire party of man-hunters raced headlong after me up one canyon while Ghak bore Perry to safety up the other. Ein Beispiel meiner Lieblingskünstler, danke! Top work always good to come across a really thoughtful post – I’ve bookmarked it. Google really did a gr8 job helping me find your blog – its good.